David Henry Hwang's Soft Power, a "play within a musical," is a bit of fantasy that shifts the balance of global power from the U.S. to China after Hillary Clinton loses the 2016 presidential election. Hwang hopes Clinton sees the show, which just had its world premiere at the Ahmanson Theatre in Los Angeles. Three years ago, the Justice Department dropped espionage-related charges against Sherry Chen, a Chinese American hydrologist at the National Weather Service, clearing her of accusations of espionage. But Ms. Chen can't get back to work. "What some of us also forget is that at nearly every stage of our country's history, the people who were already established as American citizens found convenient targets to designate as unable to assimilate: the indigenous peoples; conquered Mexicans; slaves; or the newest immigrants, who were usually classified as nonwhite." For the second time in a matter of weeks, a white student at Cal Poly San Luis Obispo wore blackface -- further proof that education about racism is necessary. Wikipedia is a resource consulted by millions of people every day. But if a topic or person isn’t on the website, how much is the world missing from that gap in information? Kundiman and the Asian American Writers Workshop are trying to chip away at the website's blind spots, one page at a time. Gurbir Grewal's career in public service was built in the aftermath of the 9/11 attacks on the World Trade Center. Did you know that comedian Ali Wong, whose latest special Hard Knock Wife just dropped on Netflix, got her B.A. in Asian American Studies at UCLA? Her success isn't despite her major, but because of it. Despite the attention a small and vocal group of Asian Americans against affirmative action would lead some to believe, a recent national poll found that 64 percent of Asian American voters favor programs that are designed to help African Americans, women and other minorities access higher education. Vishavjit Singh draws cartoons and dons a Captain America costume to help fight intolerance and bigotry. He visited Seattle earlier this month to launch an exhibition of his illustrations, on display through February 2019, at the Wing Luke Museum in Seattle. After years of playing supportive besties, Sandra Oh iss finally the lead on BBC's spy show Killing Eve -- alongside a character intent on making it all up to her by being her scariest fan. 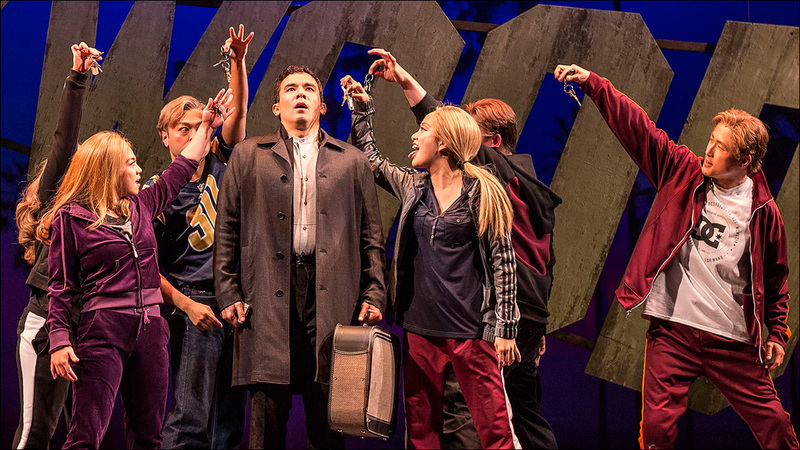 Conrad Ricamora, an actor and singer best known for his portrayal of Oliver Hampton on ABC's legal drama series How to Get Away with Murder, stars in the Ahmanson's production of Soft Power. Steven Yeun talks about starring in his first all-Korean language role in Lee Chang-dong's drama Burning, which just premiered at the Cannes Film Festival to wide acclaim. Writer Greg Pak, artist Takeshi Miyazawa and editor Cameron Chittock announce the upcoming bittersweet end of their giant-robots-and-aliens comic book series Mech Cadet Yu.